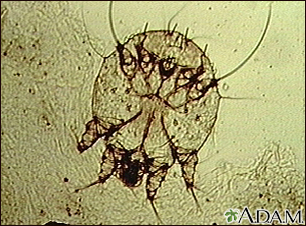 This is a photomicrograph of the scabies mite. This animal burrows in the skin, depositing both eggs and feces. Scabies infestation causes intense itching (pruritus) which leads to scratching and damage of the skin (excoriation). The infestation may last for years without treatment and has been called the "seven year itch". 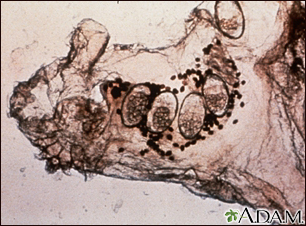 This is a photomicrograph of scabies feces in skin scrapings. This material is thought to cause an allergic-type reaction which may be responsible for the intense itching. 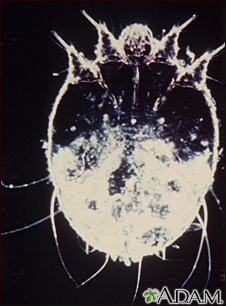 The itching may persist long after the scabies mites are killed because the dead eggs and mite feces remain in the skin. This is a highly-magnified photograph of the mite that causes scabies. 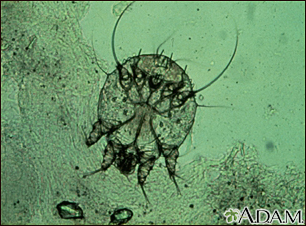 This is a photomicrograph of the scabies mite. They burrows into the skin, depositing both eggs and feces. 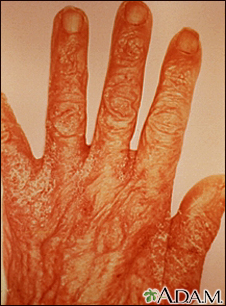 A scabies infestation causes intense itching (pruritus) which leads to scratching and damage of the skin (excoriation). If left untreated, the infestation may last for years, and has been called the "seven year itch". 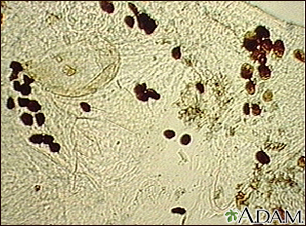 This is a photomicrograph of a skin scraping that contains a scabies mite, eggs, and feces. This animal burrows into the skin, depositing both eggs and feces. A scabies infestation causes intense itching (pruritus) which leads to scratching and damage of the skin (excoriation). If left untreated, the infestation may last for years, and has been called the "seven year itch".